iPhone/Smartphone app development has been for the past few years prohibitively expensive because they would have to be developed from scratch, using expensive developers and remaking the wheel, time and time again. Thanks to our proprietary software, we are able to utilize many of the cool functions, bells and whistles, and with our graphics expertise we can provide an app for considerably less than a custom app. We make these apps available for you and your clients to download in the appropriate app stores for a monthly fee ranging from $70 - $125 per month. Your cost of having all platforms available after development is a minimal expense in your operating budget. The benefits of putting your business on your customer's smartphone? PRICELESS! UPDATES are quick, easy and FREE (up to an hour a month) for the life of your contract! For our package price, we update or if you prefer to have control, you may update through your control panel. If you need to finance your APP, we can help! 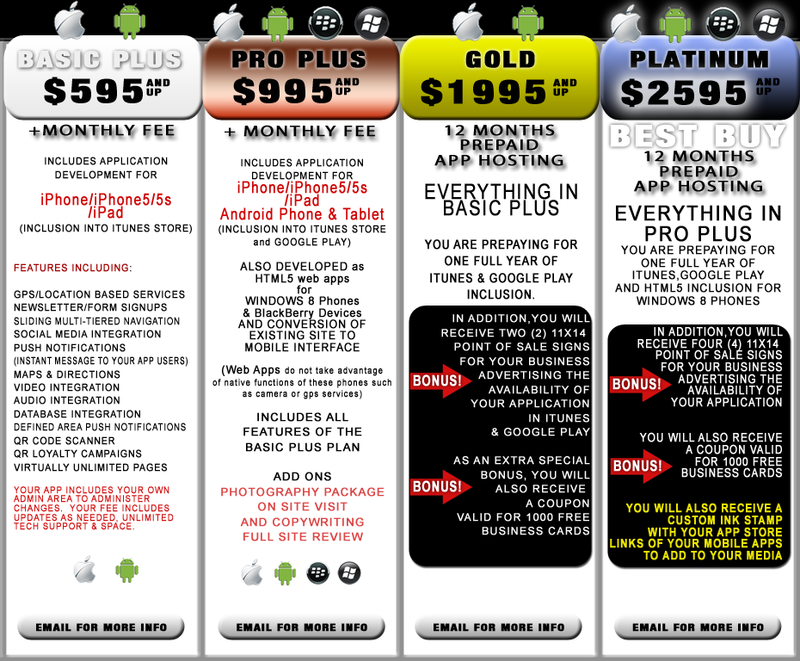 You can pick the 3 or 4 pay plan on the APP Development, and we can spread it over an entire year! Click Financing to contact us about the details.